By the middle of the 1980's, Horner was beginning to gain more and more attention on the film score stage. He already scored two Star Trek movies, Ron Howard's 'Cocoon' and James Cameron hit Sci-Fi 'Aliens' (for which he received his first Academy Award nomination for Best Score). But now, he was about to make a large step, demonstrating not only his talent for scoring, but also his songwriting capabilities. An American Tail did that for him. And it turned out to contain one of the most famous songs in movie history. What a way to begin his songwriting journey. Also, An American Tail marked the first animated feature that Horner worked on and it demonstrated that he's a natural at scoring children films. He really is a storyteller through his music. Horner would go on to score 6 more animated feature films, each one a gem. For the songs, Horner collaborated with Barry Mann for the music and with Cynthia Weil for the lyrics. What resulted were 4 wonderful songs that contained both child quality and romance in them. The first of these songs is 'There Are Not Cats in America'. Mainly, it is composed of two parts, repeated three times. In the thirst part, three mice tell their really depressing stories from their countries. After each story, it comes the refrain which is really lively and makes you sing along. The second song is 'Never Say Never'. This song demonstrates us the singing capabilities of the well-known actor Christopher Plummer and, believe me, he's a natural! A very lively song that makes you dance, but it also contains some very clever lyrics, so it is also a very moral song. Then it comes 'Somewhere Out There', the highlight of this album. It comes in two versions, one performed by cast members and one performed by professional singers. The first version is more romantic and sentimental than the second. It is performed by child actors, which are not professional but still, they do the job very well. The refrain in which they perform together is really magical. After it we have the second version, the end titles version, performed by Linda Ronstadt and James Ingram. After 'My Heart Will Go On', this is the most famous song co-written by Horner and, frankly, one of the best he's written in his career (so it comes to no surprise that it won two Grammy Awards and was nominated for an Academy Award). The guitar solo in this song is simply breathtaking, as well as the song as a whole. The last song is 'A Duo'. This isn't as good as the other 4, but it's not bad either. I would name it a medium song. OK, we're done with the songs. Let's deal with the score. Although the album doesn't have a long running time, the score is the main treat. Horner delivers pure magic through his score, a score performed by Horner's faithful London Symphony Orchestra. The album begins with the Main Title, a 5 minute track that contains Horner at his best. First, we have the first theme, also known as the Immigrants theme or Fievel's theme. It starts with a violin performing the first part of the theme, an oboe takes on the second part and then they are blended together by the full orchestra. It is an astonishing theme and it's without a doubt one of the best themes that Horner has written in the first part of his career. The second part introduces two more themes, that are playful, lively and romantic at the same time. The second track is called 'The Cossack Cats'. Here we have the first action cue of the soundtrack. Given the fact that, in this cue, the action takes place in Russia, Horner tried to give a Russian sound to it and he succeded. My version of the soundtrack contains one more track which I see that it isn't contained on this page, mainly because here we have the UK version of the soundtrack, that didn't contained the track 'The Storm'. Still, I will talk a little about it. As the title suggests, we're dealing with another action cue. But it's more scarier than adventurous and that's because Horner doesn't use much percussion in this cue, mainly strings and brasses. And he really knows how write a thriller cue not scary enough to frighten children. Next we have 'Give Me Your Tired, Your Poor'. This is a depressing cue that suggests hope at the same time. When the choir sings the last 5 verses of Emma Lazarus' poem, it gives you goosebumps. It demonstrates Horner's capability to work with both an orchestra and a choir. The poem speaks about immigrants coming to the United States, so it is was a wise decision to use it during the sequence in which both the humans and the mice arrive in the US. After it, we have 'The Market Place', a track begins a little rough but then turns into a lush tone, the best being the part the clarinet plays 'Never Say Never' in a slower tempo. Next, we have two action-adventure cues, 'Releasing the Secret Weapon' and 'The Great Fire'. After we've had these calm and lush cues, we have two tracks that captivates our attention again and prepares us for the last two score tracks. Horner knew that this was a children movie so he had to come with something that went well with the picture but not make theme even scarier. So he managed to reduce the emotional impact of these two scenes. Last, but not least, we have the best score tracks on the album, 'Reunion' and 'Flying and End Credits'. Because these are the really the film's epilogue, they reprise all the themes in a full orchestral sound. And, frankly, they will be like an ambrosia for your ears. The last track has a little John Williams-esque sound in it, but it still contains Horner's own style that is accustomed to us. Believe me, the last two tracks are simply breathtaking. 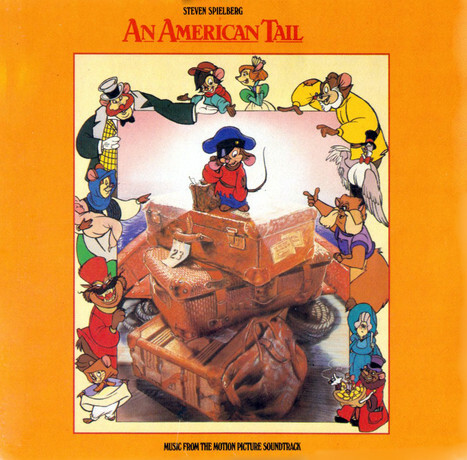 In conclusion, An American Tail remains a highlight in Horner's career, mainly because it really put him into the spotlight. And, along with the The Land Before Time, this is the best animated score that Horner has written for an animation feature. Also, it demonstrates Horner's talent to write both film scores and songs. Luckily, this hasn't gone out of print so you can still find it very easily. In fact, this one and The Pagemaster are the only animated scores written by Horner that are still a regular releases. This one really deserves a 10, for both the score and the songs. Highly recommended! A charming score for the Don Bluth animation. It has several songs, the best of which is Somewhere Out There which has to be one of my favourite songs from any film. The film version is a bit too sweet and may make some people sick, I mean, this is singing mice! The Ronstadt and Ingram version is lovely though. The best of the other songs is probably There are No Cats in America which is half sad verses and half joyful choral work. The actual score is a lot less exciting than I thought it would be. This is not a criticism, but it is just quieter than I thought. It is, very good though and has some lovely moments in it, occasionally adding in the choir where appropriate. The strange thing about this score is that there are many highly original bits and these are beautiful, but there are also many parts that appear in other Horner scores, both before and after this was written. Fortunately, they all gel quite well and produce and fine score. Comparing it to a Disney score would be difficult. It is perhaps more like The Lion King in the sense that it has a very good score but not such great songs. However, I think the songs are better than some of the Lion King ones. I would certainly recommend this to all Horner fans and fans of animation as I think it is nice to have something different to the Menken scores.